"I am just so happy that such a great museum was made for me," the Fukuoka Softbank Hawks chairman said at an opening ceremony, which was attended by Hawks owner Masayoshi Son. “I'm grateful I played baseball and hope visitors will enjoy the museum." The facility is dedicated to Oh, his life in Japanese baseball as a player with the Yomiuri Giants and later manager of the Giants and the Fukuoka Daiei and Softbank Hawks, and the champion Japan team in the 2006 World Baseball Classic. 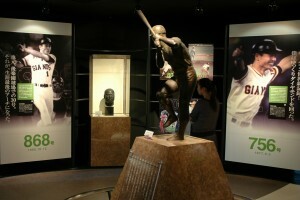 The wonderfully interactive museum is divided into sections commemorating Oh's career with the Giants during which he hit 868 home runs, his time as manager of the Hawks and his experience in leading Japan to the first World Baseball Classic title almost five years ago. There are great photos of spectacular moments in Oh's era, from his high school heroics as a pitcher in the national tournament at Koshien Stadium in 1957, to his turning professional and joining the Giants in 1959, to his milestone home runs, to retirement as an active player following the 1980 season. You can also see photos of a young Oh, working with mentor Hiroshi Arakawa in a tatami room, practicing his one-legged stance and swing with a sword while trying to cut a card suspended from a string in order to develop the excellent timing that later allowed him to become one of the greatest hitters in baseball anywhere. Oh and teammate Shigeo "Mr. Giants" Nagashima led their team to a sixth consecutive Central League pennant and Japan Series title in 1970, and they would go on to add three more to make it nine in a row in 1973. A mini-theater projects video scenes of Oh's 600th and 700th career home runs as well as the dramatic scene at Tokyo's Korakuen Stadium in 1977 when he hit No. 756 to break the world record of 755, then held by Hank Aaron. Oh's bats, spike shoes, first baseman's mitt and other items are also on display. Since the museum is in Fukuoka and Oh, at age 70 has a long history with the Hawks ballclub, there is a significant amount of space devoted to his 15-year stint as the Daiei-Softbank manager from 1994 to 2008. His uniforms are there along with photos of his winning Japan Series titles in 1999 and 2003 and the WBC trophy in 2006.